Grand Ocean Getaway 2 ,Ocean Views, Elevator!! Luxury Private Home 3200 sq ft just steps to the beach in beautiful Cherry Grove. Ocean views everywhere! HUGE great room, elegant furnishings and 55 inch Flat Screen TV, Surround Sound and DVD/blue ray player and Ipod dock. Gourmet kitchen with stainless steel appliances,granite counters and breakfast bar. Bamboo floors throughout. Private Pool ,sundeck ,exterior shower, palm tree and covered patio with grill and dining table. Each bedroom has its own private bath, 32 inch flat screen and cable TV. Separate game room with flat screen and XBOX 360. Elevator and handicapped accessible bedroom and bathroom. Walking distance to grocery store, restaurants, shops and more! Just 2 blocks from the Cherry Grove pier. Our home has something for everyone! We are a family of 6 from the suburbs of Washington DC. We love to travel to the beach together every summer with our dog Tikko which is why our home is pet friendly. We spent many summers in Myrtle beach and all our boys learned to boogie board there. This is our second home purchase in North Myrtle Beach and we hope to retire there one day. We choose this home because it is so close to the beach just a quick 2 minute walk and you're there! There are no high rise condos ocean front on our beach so its not crowded even during the peak of the summer rental season. 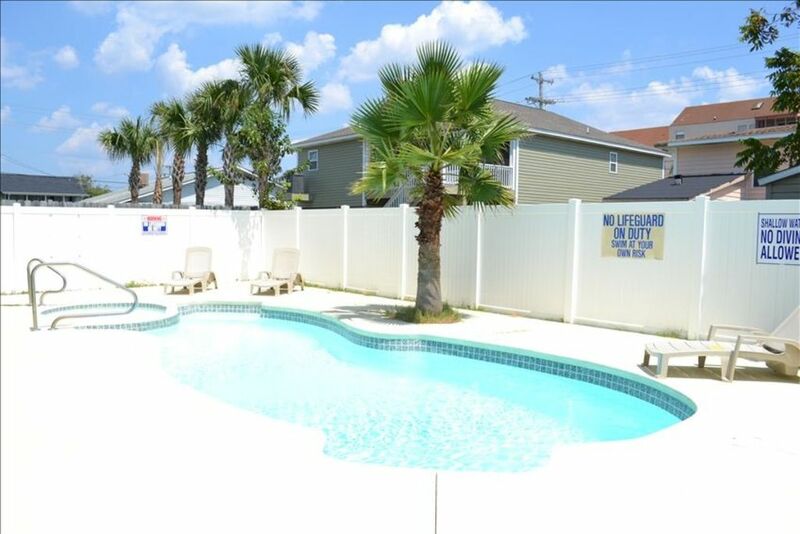 It's located on a quite street with a palm tree lined yard walking distance to the Cherry Grove Pier, grocery store and many other ammenities. Short walk to the beach and beautiful ocean views from the front porch and the windows in the great room. Walking distance of the grocery store and many other shops. Restaurants and local attractions are close by. Our home is located on a street with beach access and public parking lot 1 block away. Our driveway and carports have enough parking for 6 vehicles. We like to to be pampered when we go on vacation so we have equipped our home with top quality mattresses and bed linens. Our home is minutes from Starbucks, local restaurants, attractions, boat ramps,fishing, and more golf and mini golf courses than you can count! From the upper level there are some nice views of the ocean. game room contains dart board, xbox and board games inside the storage automan. two front decks with ocean views and large covered patio overlooking the pool. large pool deck with lounge chairs,and 2 covered patios with dining table seats 6, outdoor bar with seating for 8 and wicker conversation set. We loved this house for our family group of 14. It was very clean and roomy, close to the beach. We had some maintenance issues the first day, which were addressed promptly. Terry was very helpful. Would definitely do this house again. The home was perfect for our family. The location is great also. The home is very spacious. We enjoyed the outside patio and pool area as well. The only thing that could have made it better is having a tv outdoors to watch the game. Other than that it's amazing. Looking forward to booking our next trip. Next time we plan to stay longer. Everything you could want. Each bedroom has its own bathroom. Very spacious house. Excellent pool and outside shower is a plus. Hot tub isn’t heated but wasn’t a big deal. The small children liked it for a ‘kiddie’ pool. Outside bar was great. Only thing I would improve is lighting outside in the pool. It was dark at night. Lights are only under bar area and not on pool for night swimming. Also not very many places to hang beach towels wet suits etc. if we had more room we would have brought a small drying rack. We couldn’t hang our stuff outside because it stormed every single day at some point. Would definitely stay here again. Kitchen has a huge pantry and besides a regular fridge is a mini fridge which was perfect for beer or wine. Our family enjoyed this spacious house! The WiFi didn’t work well. It was in and out. And it kept telling every person that tried to connect that the password was invalid. It had worked for a few hours when we got there and then it kept kicking us off and wouldn’t let us log back in. Very nice area as well. Not much to do within walking distance but wasn’t a far drive until we found tons of things to do! We will be back again for sure! This summer marks the second time we have stayed at this house. It is perfect for us, our four children and their spouses, and our grandchildren. Each bedroom having its own bath gives each family the privacy it needs, but we also feel close and connected. The location is so close to the beach-just a short walk. The pool is wonderful to dip into after coming in so hot from the beach. The kitchen and dining area are plenty spacious to prepare and enjoy our big family meals. We love this house and feel so at home here. Can't wait to book it for our next beach trip!! Perfect location! Parking was great! Loved the neighborhood! We were a family of 13. I loved that we each had our own bathroom. The kitchen is awesome! Stocked very well. I couldn’t have done it with out the elevator, I have a bad knee and facing surgery when we get home. It was nice to load it up with our luggage...groceries...or our supper for an evening by the pool. If in the area I would definitely stay again. My family enjoyed staying here. Having a pool and elevator were wonderful amenities to this spacious beach home. The owners were also quick to get in touch with and responsive with questions. Half a block to the beach. Within walking distance to Boulineaus's grocery store, golf cart rental, Duffy's Seafood Shack, Three blocks to the Cherry Grove fishing Pier.